View of Anna-Sophie Berger, “Don't smoke,” 2018. 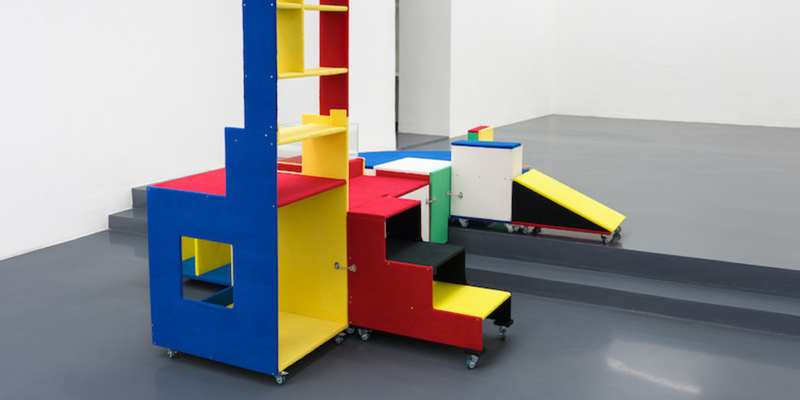 A couple steps connect the halves of this exhibition hall; it is here, in this zone of architectural transition, that Anna-Sophie Berger has chosen to position the cluster of modular objects that make up the nucleus of “Don’t smoke” (all works 2018). Each piece is named after a country in the EU, and, wrapped in color-block polar fleece, looks vaguely functional, like human-size Legos. Mounted on rollers and interlinked by hooks and eyes, together they create a large-format piece evoking a landscape of scratching posts for cats. Deutschland (Germany) takes the form of a black-red-gold staircase, while Frankreich (France) is reminiscent of a slice of cake in blue-white-red; Italien (Italy) adapts itself to the steps, Irland (Ireland) is a bench, and Spanien (Spain) is an aquarium with red-gold edging. The elements suggest a potential for being altered, expanded, or adapted at any moment, but given their size and bulkiness when bound together, they hardly seem mobile at all. It’s unclear if the installation is about a community of states in the process of transformation or a sculptural finger exercise. The same goes for the eponymous print, Don’t smoke, 2018, which supplements the sculptures and is composed of no-smoking symbols that evoke the clutter of Google image-search results. Whether Berger was attempting to stop smoking herself or to investigate the recent Austrian antismoking referendum is left unsaid; for a practice that investigates the slippery nature of the contemporary language of forms—through which political content is kept in circulation and transition—this vagueness makes sense. It’s exactly this uncertainty, this intermediate stage, that lends precision to the artist’s thematic as well as her formal and material approach.